1>Durable body, one piece, non-corrosive white glass reinforced polyester body protects the LED light source from water and dirt from vehicular traffic and natural elements. 3>Delivers 7~10 footcandles from eight foot installed heights to comply with parking drive lane safety and building codes. 4>IP65 rated fixtures with hermetic sealing. 5>Two option installation way: surface mount &suspended mount. 6>Integral high performance LED driver, universal input voltage 100~277VAC (200~480VAC optional), 50/60Hz. 8>0~10V dimmable, emergency pack kits are available for special request order. led tri-proof light ip65 used for canopies ,farmyards, parking garages,cold storage facilities,dust&wet location environments. 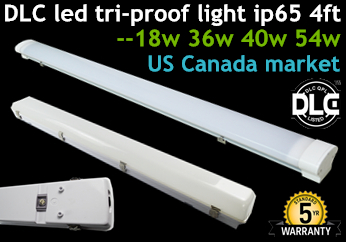 Yes, we have our own factory, so we could offer led tri-proof light ip65 with competitive prices! being, we would offer you the free lamp parts or new lamps!